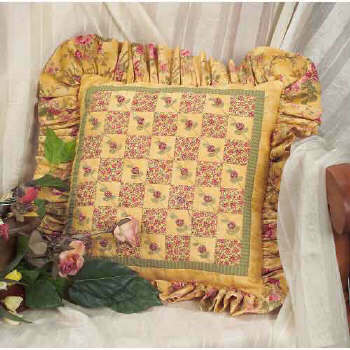 This is a lovely pillow design measuring approximately 18" square. It features embroidered stems and leaves and little tiny rosebuds that are made from yoyo's. It is a new look using some traditional techniques. Easy construction and fun for the beginner or seasoned quilter.